Are you visiting Kissimmee, FL in the near future? Are you wondering what else to do especially in the outdoors? Largemouth bass fishing is the perfect outdoor activity for you. 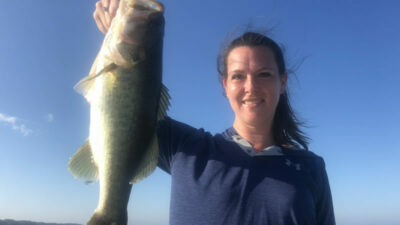 Take your family on a fishing adventure of a lifetime right here in Central Florida on Lake Toho. 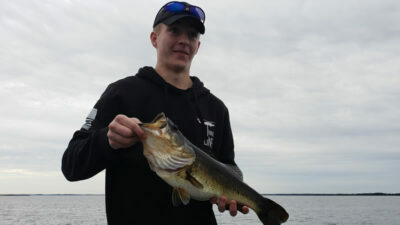 Join us on a hydrilla Lake Toho fishing charter on your next visit. Hydrilla is a fantastic structure to fish around. Most Florida lakes are abundant with this natural flowing grass. It provides great structure and home to numbers of largemouth bass. In order to find success fishing around Hydrilla, hop on board with one of our local experts. They have spent hours, days and years on the water. If you are looking for an exceptional experience, you have to explore Lake Toho with Captain’s John Leech, Steve Niemoeller, and Brent Nelson. right here in Kissimmee, FL. Tracy and his son adventured out on Lake Toho and had a fantastic time. Now is the time of year to come to explore what Lake Toho has to offer. This father-son duo got out early in the morning and caught fish all trip long. Cold fronts may have slowed the action down but that did not stop the big bass from coming out to play. Tracy and his son caught some great numbers ranging from 20-25. They caught 6 fish over 4 pounds with the biggest bass weighing 6.12 pounds. That’s a beautiful fish. Tracy will be back for more of this incredible action in the near future. Captain John is looking forward to getting them back out for even bigger fish. 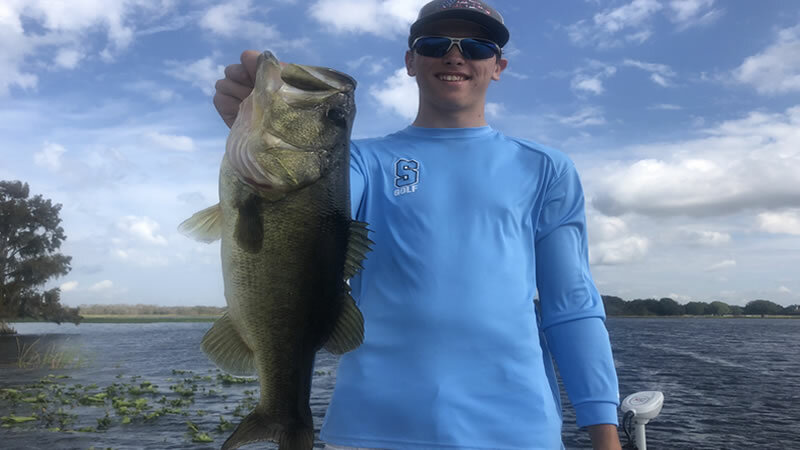 Not long after this awesome fishing adventure, Captain Steve Niemoeller explored what Lake Toho Bass Fishing had to offer. He had the pleasure of fishing with Mike and Jen. While traveling from New York’s capital, they wanted to get on the bass with artificial baits. quality bass. Throw them out under a cork or free line and have an absolute blast watching them get sucked under. Most of the bass were caught on outside hydrilla edges. 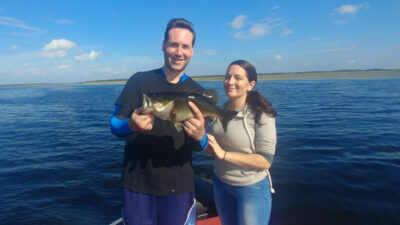 Mike and Jen caught over 12 largemouth bass weighing up to 3 pounds. The action has been steady and getting better by the day. They are looking to come back soon to fish on Kenansville Lake. Captain Steve is looking forward to their next adventure soon! 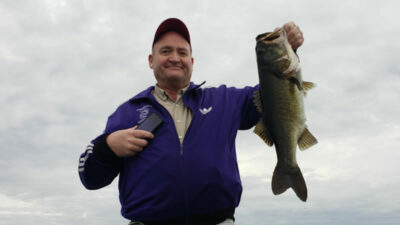 Just shortly after this fishing trip, Captain Brent Nelson explored Lake Toho. He had the pleasure of fishing with Tony, Carrie, and Mark. They were traveling from Ohio looking to spend some quality time in Central Florida. It was a quick 4-hour fishing adventure with a lot of great action. The largemouth bass was out to play on this fishing trip. This group of guys and gals landed over 31 Florida largemouth bass. The biggest weighed in at 4.40 pounds. Most of the fish were taken on wild-caught live shiners but they also caught them on artificial baits. The most effective baits were zoom speed worms and rattle traps. Tony caught his personal best on a speed worm weighing in at 3.50 pounds. The action is strong and you don’t want to miss out on your adventure in the near future. Captain Brent is looking forward to fishing with Tony, Carrie, and Mark again soon!